Born in Yorkshire, England, Alan studied at Batley College of Art. His early works established him as an artist of unique talent and quality. About thirty years ago, he started to move away from railway and landscape compositions towards motoring and motor racing. 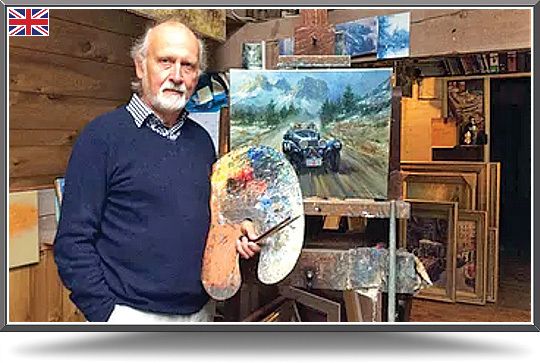 The classical and romantic mood created through his lifestyle paintings has broadened the appeal of automotive art. Alan is convinced that if the enthusiast school is ever to be recognized and valued as it ought to be, it must produce pictures of such an artistic quality that they can be appreciated and valued by all art lovers. They must also have pictorial merit to hang anywhere - not only in the studies of car enthusiasts. Fearnley’s oil on canvas paintings feature in private collections worldwide, and attract a large international following through reproductions. This artist’s reputation has also led to commissions from Rolls Royce, Porsche, Mercedes-Benz and other prestigious companies, as well as exhibits by the Royal Institute of Oil Painters in London. Commission Alan to create a unique painting for you!